Outside of Hu Kitchen, a restaurant in NYC. I think the restaurant should have written “My great-grandmother’s legendary bread recipe had corn flour in it made from the maize of genetically modified seeds.” –Nobody, and nobody ever should have to. I saw the sign. (and it opened up my eyes….). I saw the chalkboard sign, outside of a restaurant in New York City. It caught my eye. I agree. We are better off without processed foods. Our great grandparents would not have recognized Cheetos, Fritos, even Honey Nut Cheerios, and we certainly don’t need those things. (I eat them once in a while. I’m not a food saint. I eat whole foods more often). But should we really stay away from foods just because our great-great grandparents wouldn’t recognize them? Should we idealize the way people ate in the past, and be so skeptical of anything new in the arena of food? Might there be some good, new things available? Maybe not chemical things, maybe not genetically modified ingredients, but other foods that walk the line between food and medicine? 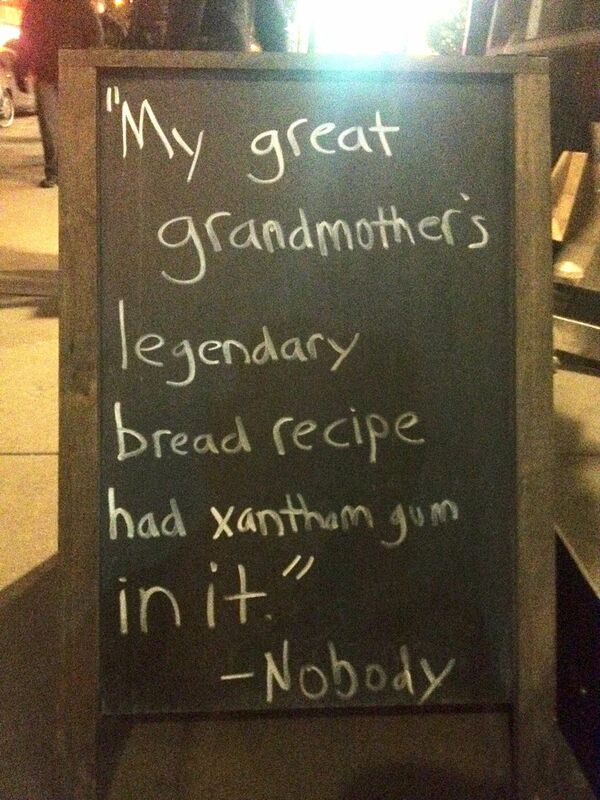 First, A Note About Xanthan Gum. It’s spelled XanthaN. With an N.
Xanthan gum is a sugar-like compound made by mixing aged (fermented) sugars with a certain kind of bacteria. It is used to make medicine. Quote from WebMD. Xanthan Gum is used as an emulsifier, a thickener, and even in medications, as well as in gluten-free baked goods to help the ingredients cohere. The only slightly negative thing I have read is that it can cause bloating, as 1 tablespoon has 7 grams of fiber. So, not surprisingly, it can also be used as a laxative. My great-grandchildren will be able to say that their great-grandmother used Xanthan Gum in her legendary gluten-free muffin recipe! Ha! I did indeed. Baking batch after batch of gluten and sugar free muffins (which I then sold at the Living Local Festival on Martha’s Vineyard—see previous post), I tweaked the recipes until they were just right. Gluten free muffins don’t contain any gluten, surprise surprise, so sometimes the muffins would be too crumbly and fragile, and would easily fall apart in my hand while I was trying not to scarf if down. My muffins consisted largely primarily nut meals—almond and hazelnut—instead of flour, with a little bit of coconut flour and rice flour. I decided to try ½ a teaspoon of xanthan gum for a batch of 10 muffins. It worked marvelously! Too much xanthan gum made the muffins too springy, like eating a sponge. Yuck. Ten more facts about it here. The enormous amounts of meat and starch and the short shrift given to fresh fruits and vegetables made constipation the national curse of the first four or five decades of the nineteenth century in America. Those may have been our great-great-great grandparents, but that doesn’t sound like an eating model to emulate. Sounds like they could have used the fibrous Xanthan Gum. Really. I mostly ask this question about whether we should be skeptical of “new foods” because of my own recent skepticism over pills, powders, supplements and special oils. My father is an age management doctor, and he deals with both nutrient and hormone levels in aging people. He also takes more pills than anyone I know. In the early days when he tried to convince me to take nutritional supplements, I wondered, why can’t I just get this from my food? We should be able to get what we need from food alone, right? Poor soils, he told me. Our soils are depleted and don’t have the same nutrient levels they used to, and so our food is less nutritious. Even if we eat vegetables, they won’t have the amounts of nutrients we need. Well, what if I ate all my food from local, small, organic farms, with rich, healthy, manure-enriched, soil? Then would it be nutritious enough? The truth is, I don’t eat all my food from local, small, organic farms. I don’t get to eat all the healthy things I want to some days, because I’m on the go, I am traveling, I don’t have time, I have cravings for nothing but ice cream, for a million reasons. I try my best. But it’s kind of nice to know that I can boost my immune system with some supplements in the wintertime, I can get some vitamins into my smoothie with the green powder, I can take some omega threes with fish oil (also in my smoothie). My great-great grandparents never saw lemon-flavored fish oil that can be added to salad dressings or smoothies or other things. Nuh uh. They would recognize fish, though. But maybe one day, I don’t get the opportunity to eat fish? Well, I can still have the benefits of it. There are lots of things available to us now that didn’t used to be. We have a whole slew of health problems that our great-great grandparents didn’t have (including obesity and diabetes) but we also have a whole slew of ways to make our lives healthier while meeting the demands of a fast-paced culture. These are questions to be pondered. Should we all take supplements? How do we know which to take? Does drinking a green juice make a difference, or is it placebo, and even if it’s placebo is that so bad? Is fish oil a good thing or a bad one? Is it hurting anyone? I feel good putting some extra nutritional punch, as my friend Tara says, in my smoothies. I am glad to know I can take vitamin D and Echinacea in the wintertime when I’m feeling under the weather. I put maca powder in smoothies, too, because I heard it’s a superfood. No, I don’t really know what it does. I think gluten-free baking can have benefits because of what is in it, like nut meal and nutritious flours, not only for what’s not in it. I don’t think its bad to use some Xanthan Gum. I think my great-great grandparents would recognize chicken and beef and pork. I don’t think they would recognize that it more often than not has hormones in it. That is a problem. I think my great-great grandparents would recognize corn (maybe? ), I don’t think they would recognize that it was grown from a genetically modified seed. And we can’t recognize it either cuz no one tells us or labels it. That is a problem, too. Xanthan Gum…not so much.